How could a guaranteed paycheck keep everyone out of poverty without bankrupting our society? Consider for a moment that from this day forward, on the first day of every month, around $1,000 is deposited into your bank account — because you are a citizen. This income is independent of every other source of income and guarantees you a monthly starting salary above the poverty line for the rest of your life. The idea is called unconditional or universal basic income, or UBI. It’s like social security for all, and it’s taking root within minds around the world and across the entire political spectrum, for a multitude of converging reasons. Rising inequality, decades of stagnant wages, the transformation of lifelong careers into sub-hourly tasks, exponentially advancing technology like robots and deep neural networks increasingly capable of replacing potentially half of all human labour, world-changing events like Brexit and the election of Donald Trump — all of these and more are pointing to the need to start permanently guaranteeing everyone at least some income. 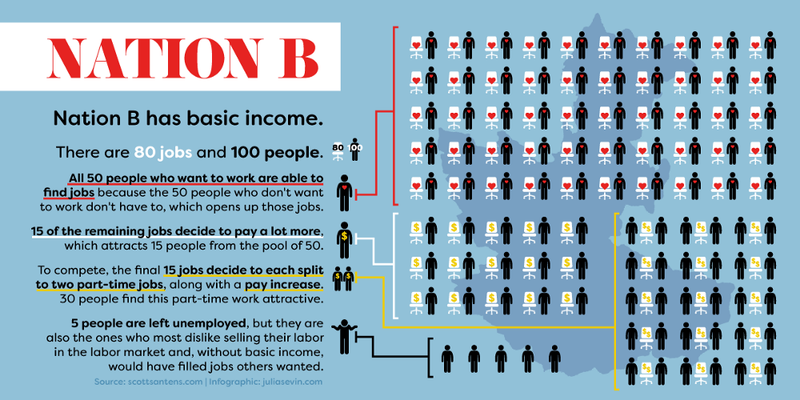 It may surprise you to learn that a partial UBI has already existed in Alaska since 1982, and that a version of basic income was experimentally tested in the United States in the 1970s. The same is true in Canada, where the town of Dauphin managed to eliminate poverty for five years. Full UBI experiments have been done more recently in places such as Namibia, Indiaand Brazil. 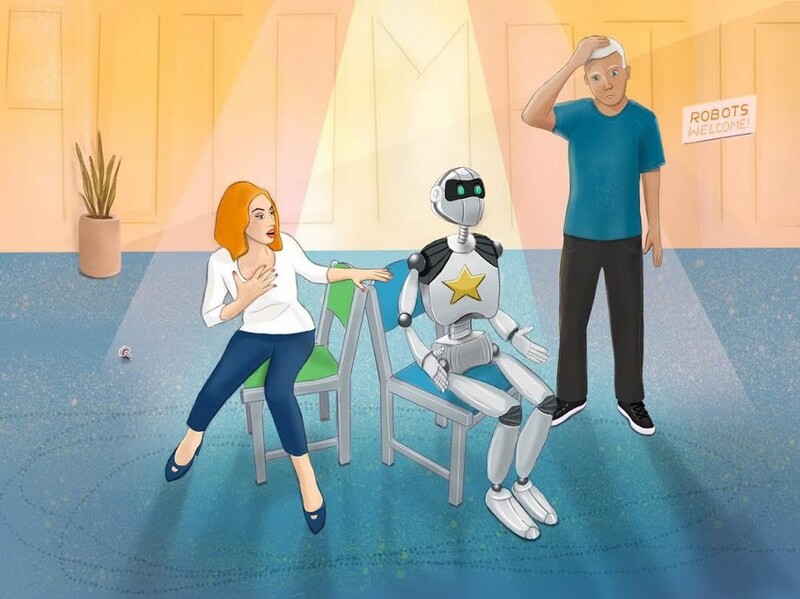 Other countries are following suit: Finland, the Netherlands and Canada are carrying out government-funded experiments to compare against existing programmes. Organizations like Y Combinator and GiveDirectly have launched privately funded experiments in the US and East Africa respectively. What tends to go unrealized about the idea of basic income, and this is true even of many economists — but not all — is that it represents a net transfer. 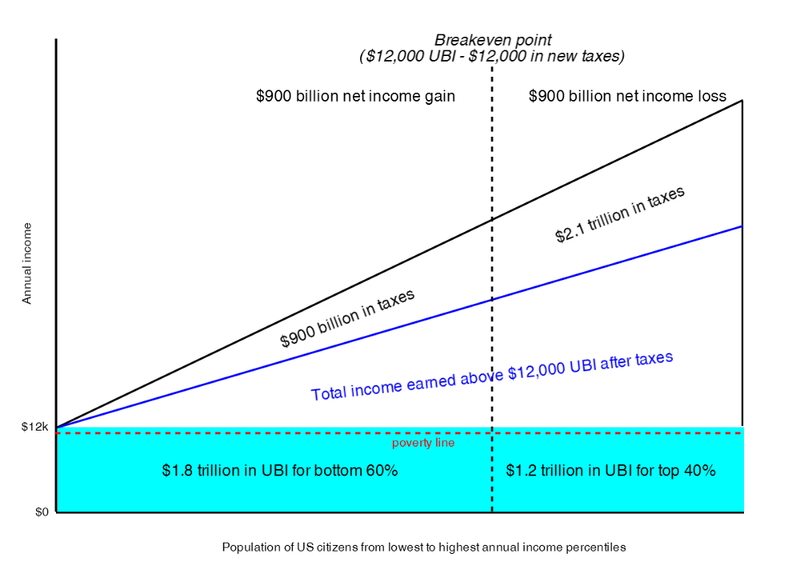 In the same way it does not cost $20 to give someone $20 in exchange for $10, it does not cost $3 trillion to give every adult citizen $12,000 and every child $4,000, when every household will be paying varying amounts of taxes in exchange for their UBI. Instead it will cost around 30% of that, or about $900 billion, and that’s before the full or partial consolidation of other programmes and tax credits immediately made redundant by the new transfer. In other words, for someone whose taxes go up $4,000 to pay for $12,000 in UBI, the cost to give that person UBI is $8,000, not $12,000, and it’s coming from someone else whose taxes went up $20,000 to pay for their own $12,000. However, even that’s not entirely accurate, because the consolidation of the safety net and tax code UBI allows could drive the total price even lower. The true net cost of UBI in the US is therefore closer to an additional tax revenue requirement of a few hundred billion dollars — or less — depending on the many design choices made, and there exists a variety of ideas out there for crossing such a funding gap in a way that many people might prefer, that would also treat citizens like the shareholders they are (virtually all basic research is taxpayer funded), and that could even reduce taxes on labour by focusing more on capital, consumption, and externalities instead of wages and salaries. Additionally, we could eliminate the $540 billion in tax expenditures currently being provided disproportionately to the wealthiest, and also some of the $850 billion spent on defence. But what about people then choosing not to work? Isn’t that a huge burden too? Well that’s where things get really interesting. For one, conditional welfare assistance creates a disincentive to work through removal of benefits in response to paid work. If accepting any amount of paid work will leave someone on welfare barely better off, or even worse off, what’s the point? 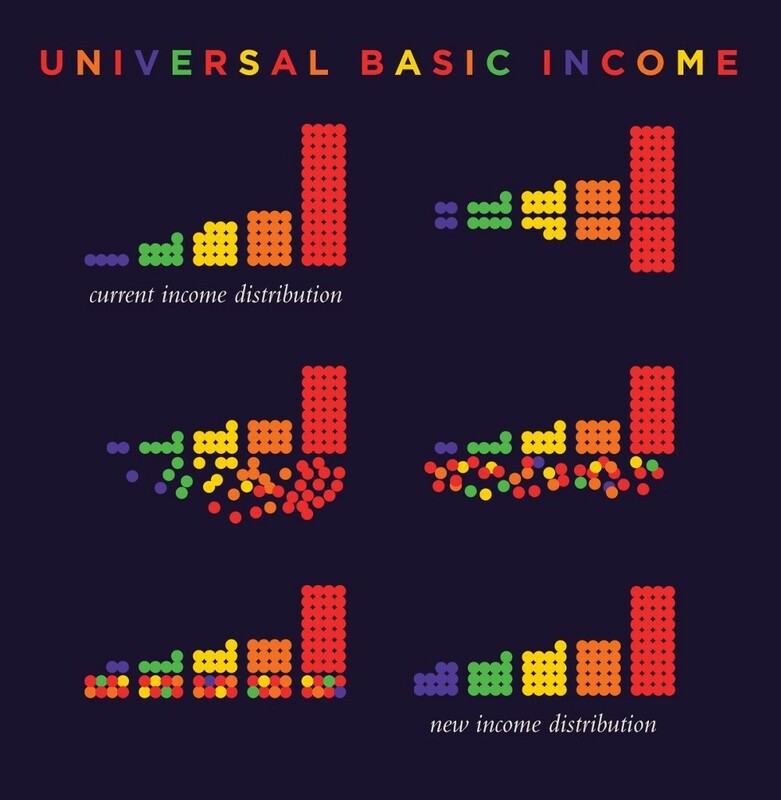 With basic income, all income from paid work (after taxes) is earned as additional income so that everyone is always better off in terms of total income through any amount of employment — whether full time, part time or gig. 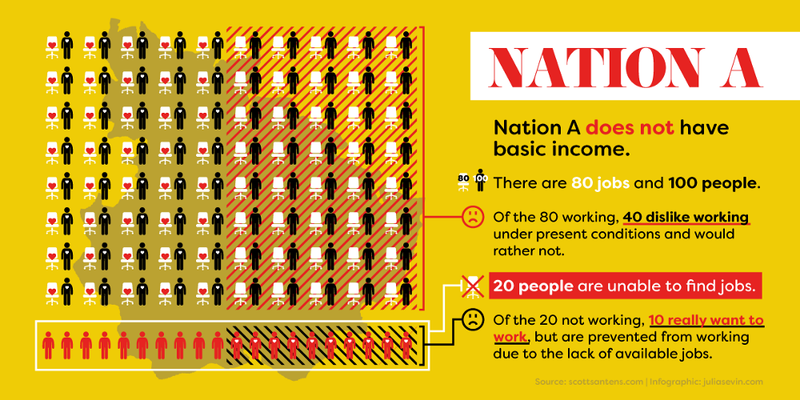 Thus basic income does not introduce a disincentive to work. It removes the existing disincentive to work that conditional welfare creates. Basic income thus enables the future of work, and even recognizes all the unpaid intrinsically motivated work currently going on that could be amplified, for example in the form of the $700 billion in unpaid workperformed by informal caregivers in the US every year, and all the work in the free/open source software movement (FOSSM) that’s absolutely integral to the internet. At the same time, there are those among the unemployed who would like to be employed, but the jobs are taken by those who don’t really want to be there. This is an inevitable result of requiring jobs in order to live. With no real choice, people do work they don’t wish to do in exchange for money that may be insufficient — but that’s still better than nothing — and then cling to that paid work despite being the “working poor” and/or disengaged. It’s a mess. Basic income fundamentally alters this reality. By unconditionally providing income outside of employment, people can refuse to do the jobs that aren’t engaging them. This, in turn opens up those jobs to the unemployed who would be engaged by them. It also creates the bargaining power for everyone to negotiate better terms. How many jobs would become more attractive if they paid more money or required fewer hours? How would this reorganizing of the labor supply affect productivity if the percentage of disengaged workers plummeted? How much more prosperity would that create? Consider now an economy with basic income. Let’s call it Nation B. For every 100 working age adults there are still 80 jobs, at least to begin with. The disengaged workforce says “no thanks” to the labor market as is, enabling all 50 people who want to work to do the jobs they want. To attract those who demand more compensation or shorter work weeks, some employers raise their wages. Others reduce the required hours. The result is a transformed labor market of more engaged, more employed, better paid, more productive workers. Fewer people are excluded, and there’s perhaps more scope for all workers to become self-employed entrepreneurs. Simply put, a basic income improves the market for labor by making it optional. The transformation from a coercive market to a free market means that employers must attract employees with better pay and more flexible hours. It also means a more productive work force that potentially obviates the need for market-distorting minimum wage laws. Friction might even be reduced, so that people can move more easily from job to job, or from job to education/retraining to job, or even from job to entrepreneur, all thanks to more individual liquidity and the elimination of counter-productive bureaucracy and conditions. Humans need security to thrive, and basic income is a secure economic base — the new foundation on which to transform the precarious present and build a more solid future. That’s not to say it’s a silver bullet. It’s that our problems are not impossible to solve. Poverty is not a supernatural foe, nor is extreme inequality or the threat of mass income loss due to automation. They are all just choices. And at any point, we can choose to make new ones.